To attend this celebration, please click here. 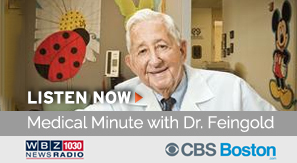 Donations can be made in memory of Dr. Murray Feingold by clicking here. Please join The Genesis Foundation for Children for a Memorial Service in remembrance of our Founder and President, Dr. Murray Feingold. The service will be open to the public and all are welcome to pay their respects. The service will take place in the Eden Vale Ballroom and begin at 5:30 pm sharp. A reception with light refreshments will follow. If you would like to send a sympathy card to the Feingold family, please send it to The Genesis Foundation for Children, 1347 Main Street, Second Floor, Waltham, MA 02451. In lieu of flowers, Dr. Feingold’s family has asked that you make a donation in his memory to The Genesis Foundation for Children.